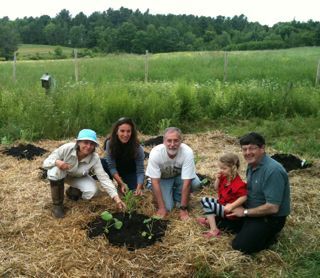 Permaculture has taken root at Belfast Cohousing & Ecovillage. 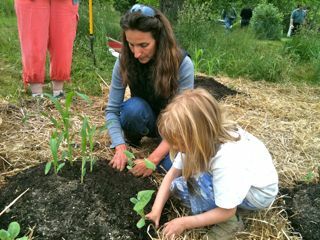 At the June 13th Open House, cohousing adults and kids worked with exploring member Barbara Crowley and equity member and UMaine professor Joline Blais to build a "Three Sisters" garden on the land adjacent to the site. In keeping with these principles, the children's garden was created without any tilling of existing soil (care for the soil web organisms). The gardeners set down recycled cardboard over manure from Sanna McKim's horse barn (trucked over and pitchforked by cohousing members Denise Pendleton, Sanna, Jon Ippolito and Jeffrey Mabee) to nourish the soil and suppress weeds, a technique known as sheet mulching. On top of the wet manure and cardboard laid down by Elizabeth Garber and the amendments donated by Mitch Henrion, community gardeners pitchforked household compost from Joline's rental house in Belfast this past winter into evenly spaced cones about a foot high. 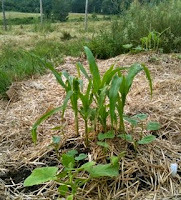 On these they placed a layer of mature compost, and planted corn and squash seedlings from Joline's greenhouse surrounded by bean and nasturtium seeds. The Three Sisters is an indigenous technique Joline learned from her research at LongGreenHouse, a collaboration with Wabanaki elders based on exploring the intersection of Permaculture and Native culture. This plant "guild" combines three plants that most people think of as separate crops but that support each other symbiotically. The corn provides stalks for the beans to climb; the prickly leaves of the squash fend off hungry critters and provide a natural mulch to keep roots from drying out in hot summer sun; and the beans fix nitrogen in the soil for the other two. Nasturtiums—which produce spicy edible leaves, and yummy colorful flowers—grow in the spaces between adding mulch, and producing biomass for increased long term fertility of the soil. A common 'fourth sister' —sunflower or its perennial relative jerusalem artichoke—is often planted on the north side of the garden circle, providing beauty, seed for humans and wildlife, and a wind barrier for the crops. Meanwhile Alan Gibson's intrepid crew of cohousing kids hammered siding onto the nearby tree house. It will soon be ready for occupancy! I was praying to the sky for a beautiful day on Saturday. All of my begging paid off. It was a pleasantly beautiful day, unfolding into a crisp new moon of stars, music, and fire. Earlier in the day Lindsey, Alison and Sawyer came by with Toby the dog, to set up their tents and asked if we needed help. Sawyer stayed at our house the rest of the afternoon while the ladies went to visit family in the area. Sawyer made new friends with the kids in the house, Parula, Sorrel and Linny. He was unsuspectingly roped into childcare for the afternoon, and for that I am extremely thankful! 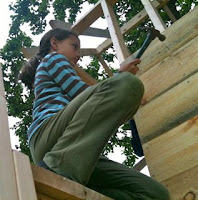 After all, spontaneous childcare is part of what cohousing is all about, right? I had brief glimpses of him swinging and climbing the ladder and going down the slide on our swing set with the kids. They seemed to me to be having a magical time, and there were 4 new friends made that afternoon. 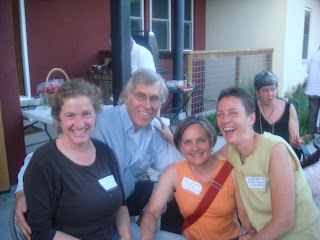 Our guests arrived for the cohousing potluck/bonfire/campout by around 5:15. Delicious food started filling our dining room table, tents spotted the back yard, dogs ran around playing, and kids filled the air around them with bubbles supplied by Jeffrey. By 6:30 our back yard was full of people eating amazing food and chatting about life and days to come. I looked around and realized how lucky I am to have found such a great group of people to share a Saturday evening and night with. As the sun began to lower itself on the horizon, the food simultaneously disappeared into all of our bellies and the draw of the bonfire began. On a side note, I had pulled my back several days previous to this event, and I was in desperate need of some relief. I had thought I would seek out one of the acupuncturists among the group, and told Elizabeth about my pain. She immediately told me to find a place to lie down, which happened to be on the kitchen floor, and pulled her emergency needles out of her wallet. How unique it was to be lying on my kitchen floor receiving such relieving treatment, amidst people coming in and out with dishes and food, always in question and amazement as to what was taking place. It was an experience I don’t think I will easily forget about. Mary joined Elizabeth to add some energy work towards the end of the session. When the two decided they were done, my body was in a completely different state than it had been just a half hour previous. I admit I was still in a lot of discomfort and pain, but my entire backside had been in contraction to compensate for the acute injury that had taken place, and all of that tightness and discomfort had been dispersed, and my body was able to focus on healing the specific origin of the pain. It was another amazing moment of support by our friends in cohousing… WOW, and THANK YOU! After this healing session, my head was in an amazing space. Just a short time later I was talking with James, Lindsey and Steve. Steve mentioned something about creating a big extended family with all of the cohousers, and I didn't have words to say at the time, but now I think that this is indeed such a great idea! We had already been sharing such amazing things that I would already consider to be a key part of family; great food, inspiring conversation, healing energies, childcare, helping hands with work, and countless other items to add. It seems to be a given that we all adopt each other as family! I headed out to the bonfire to find a nice large group sitting around a blazing fire, singing songs, playing guitars and cozying up to one another. These were some beautiful moments. The angelic voices of the group came together for some traditional, silly and heartfelt songs. I could tell that some of our members just feel the most comfortable singing and playing music when a fire is roaring. It was such a peaceful evening. The sparks of the fire fizzled up to a sky black and full of shimmering stars on the new moon of June. I looked around and felt so happy that these are the people that will soon be my neighbors. Yay! What is the ultimate destination for aspiring cohousers, cohousing residents, cohousing professionals, and community experts? 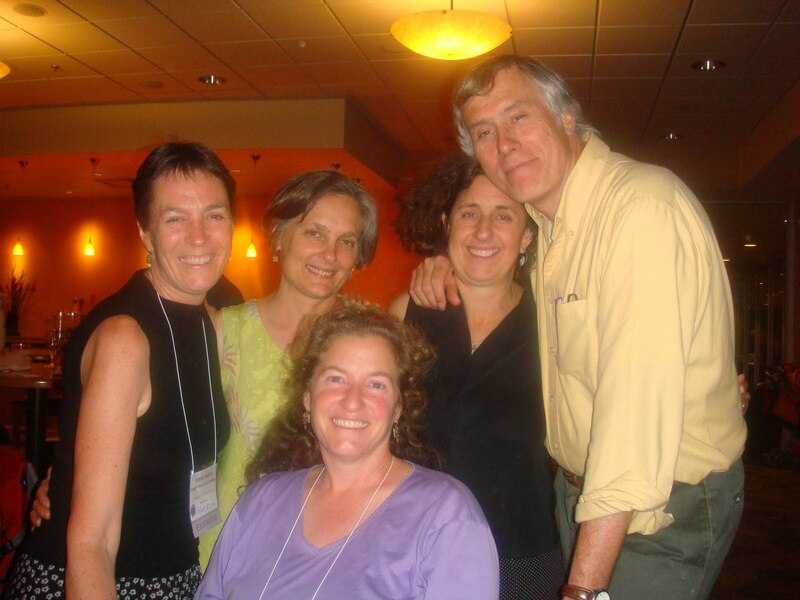 The 2010 National Cohousing Conference in Boulder, CO! Project Manager Sanna McKim, and Steering Committee members Wendy Watson and I spent last week at this incredible conference. Here we are (left) pictured with Chuck Durrette, an architect who, with his wife Katie (pictured with us below), is credited with bringing the Danish cohousing model to the U.S. Click here to see Chuck's work. We spent the week visiting vibrant cohousing communities in the Boulder & Denver area and attending workshops on almost every aspect of creating a cohousing community in hopes that the knowledge we gained would help us towards the completion of our own cohousing community: Belfast Cohousing & Ecovillage. At the end of the week, all 3 of us had reached consensus... this conference gave us many more tools and encouragement to tackle the final phase of our project! At the conference we met many folks who were in various stages of developing their project. I was awed by the high level of commitment, dedication and determination of those in both developing and developed cohousing communities who have spent extraordinarily large amounts of money and time to bring a community to completion. Some communities talked of ten-year celebrations happening this year, while for others the community is only in the first exploratory, "wouldn't it be nice if" stage. This is when I realized how far we have come. In three years we've accomplished so much... with almost 2/3 of membership, our land purchased, permits and site engineering completed, common house and unit designs completed, as well as the legal condo docs, committees up and running, and more. I heard from others in the development phase who have spent three years looking for a piece of land to build their community on, only to lose most of their members in this process as the membership disagrees on which piece of land is ideal. I also heard the stories of those who are struggling with serious burn out and hadn't established the value or practice of having fun together. I was asked by several to share our list of fun things to do in this upcoming final phase of development as some forming communities hadn't done anything like this. Leaving this conference, I feel inspired and proud of what we at Belfast Cohousing & Ecovillage have already done, and confident that our group has what it takes to see this project through to breaking ground and move-in!